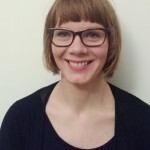 Rachel was previously Assistant Curator, European Decorative Arts, at National Museums Scotland. 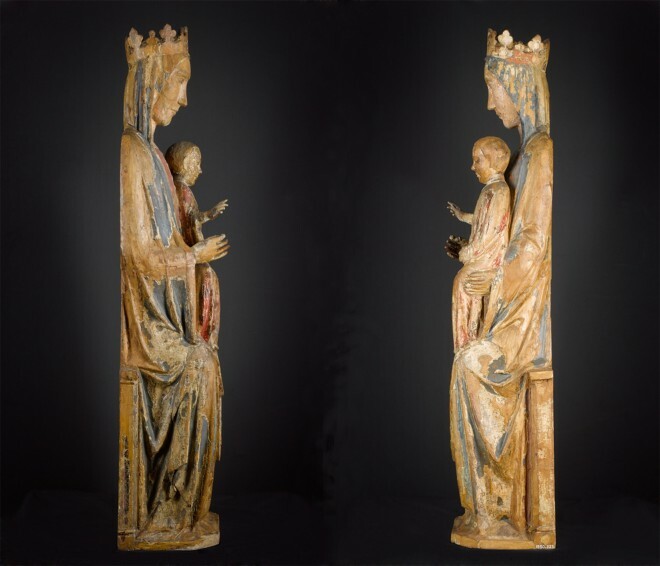 National Museums Scotland is home to an exceptional sculpture by an anonymous artist known to scholars as the Maestro della Santa Caterina Gualino. 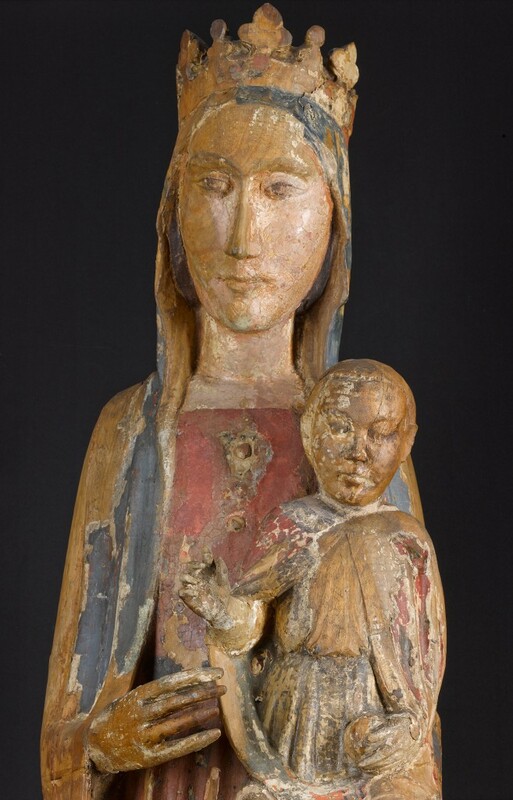 Bought in 1950 from the collection of the recently deceased Sir Michael Sadler, no other Madonna and Child by this enigmatic artist can be found outside of Italy and only a few others are in public hands. 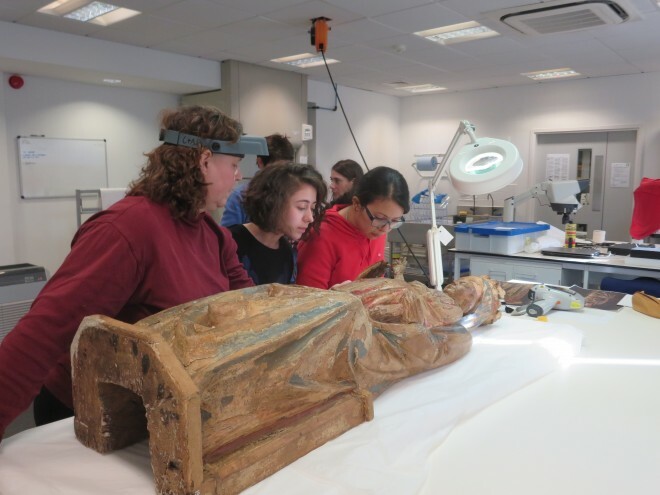 We are now undertaking extensive art historical, analytical and conservation work to prepare the sculpture for display in the new Art of Living gallery opening next year. In April 2015, I teamed up with Dr Luca Palozzi, British Academy Postdoctoral Fellow and Visiting Teaching Fellow at the University of Edinburgh, to explore the history and context of the object with the help of a Museums and Exhibitions Grant from the Association of Art Historians. 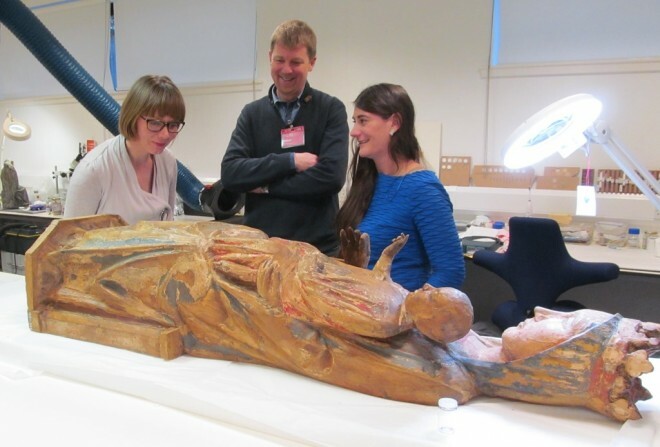 In September, the Collections Services department here at National Museums Scotland was awarded monies from The Henry Moore Foundation to allow us to pose and answer a series of further questions – these include finding out more about her original appearance, and understanding both her construction and the type of wood used in her making. The aim of this research is twofold. We want to ensure that the work we do in the museum – both in terms of display and in terms of conservation – is responsible and accountable, and we hope to understand more about the origins, background and practice of a sculptor about whom virtually nothing is known. These two project paths converged at the beginning of December, appropriately on the Feast of the Immaculate Conception. 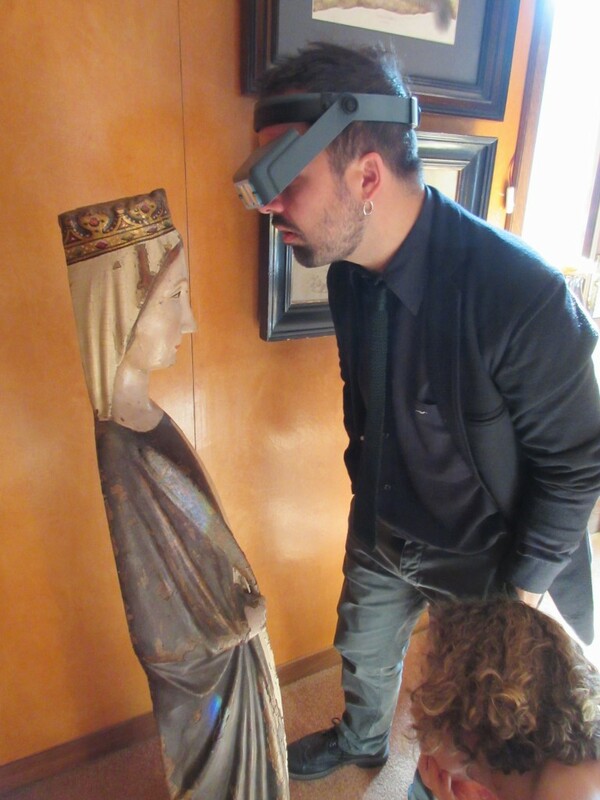 Luca and I, with our artefacts conservator Diana de Bellaigue, travelled to Turin to inspect the famous figure of St Catherine, the eponymous sculpture from which the Italian art historian Giovanni Previtali took the name “The Master of the Gualino St Catherine”. When Previtali became acquainted with it around 1960, the figure was in the collection of Italian industrialist Riccardo Gualino. Today it is still in the same city and still in private hands, albeit those of another collector. He generously granted us access to the figure and patiently answered our many questions. We were also greatly aided by Mr Bruno Botticelli, whose expert eye for the sculpture of this period and region was indispensable. The visit was extremely important for all three of us. 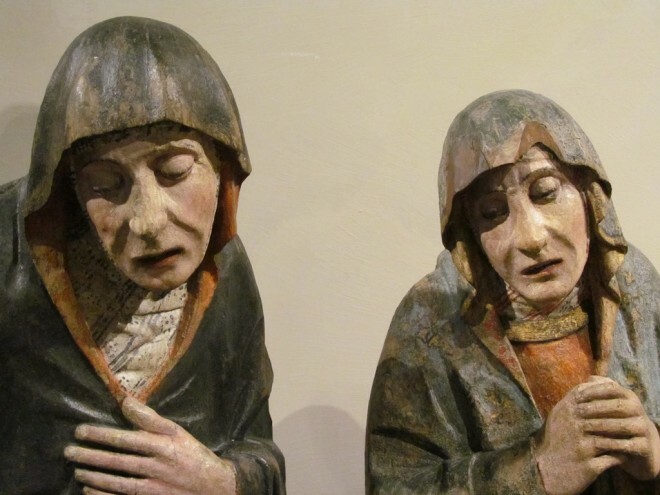 At first glance, our Madonna here at the museum appears quite distressed; she is some 700 years old after all. From the sculpture as she is now, we are able to say quite a bit about the construction of the piece and the tools the artist may have used, but much less about the painted surface which she once had – and when and why she may have become as stripped back as she now is. Traces of surface paint and mineral testing have provided us with some tantalising clues about her original appearance and visiting the Saint Catherine gave us more information about the finish that she once may have had. As you can see from the photographs, the painted surface of the St Catherine is still largely intact. 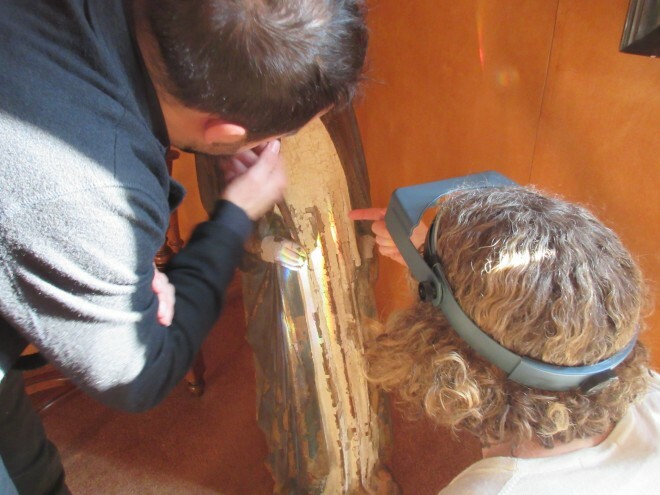 In particular, we wanted to try to understand how the artist and subsequent artists/restorers/conservators had built up the paint layers, and how this compared with our Madonna. Diana inspected the figure thoroughly, spying many tiny clues which revealed a more complex story than meets the eye initially. While this trip was financed by the Association of Art Historians, the grant we have obtained from The Henry Moore Foundation has allowed paint samples to be taken from the sculpture at National Museums Scotland (thank you Dr Mark Richter of Glasgow University for assisting with this). These are now in the process of being prepared for analysis by Dr Lore Trolean, our own analytical scientist. Very soon we will be bringing all of these strands together, so watch this blog for more information about our findings and how these influence the decisions Diana makes about how to treat the figure. Luca will be back with a blog about the significance of this object, its geographical and art historical context, and I will add something about the history of the object before it came to the museum. 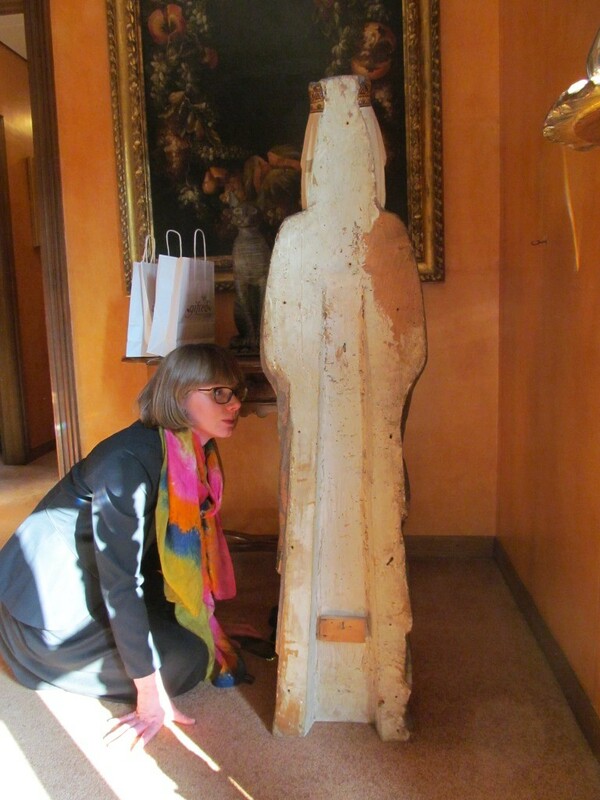 The visit also allowed us to inspect sculpture from other Italian regions of the same period, as well as Italian sculpture in wood more generally. We were able to view the new displays of art and applied arts in Turin’s Palazzo Madama, and to see the Gualino collection from which the St Catherine once came and which is now part of the Galleria Sabauda. Particularly importantly, we were able to make a brief visit to the city’s celebrated and newly refurbished Egyptian museum in preparation for the next phase of development at National Museums Scotland. We are extremely grateful for the support of the Association of Art Historians and The Henry Moore Foundation, without whom we would not have been able to envisage a collaborative project on this scale. And it goes without saying that this visit in particular would not have been possible without the generosity of Mr Botticelli and the St Catherine’s present owner. 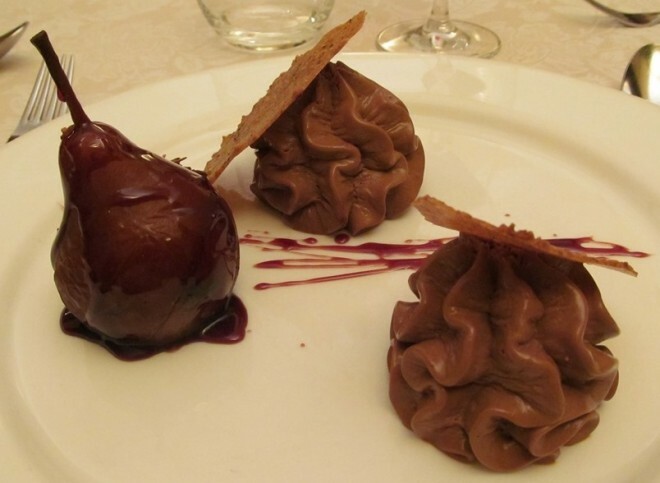 We owe an enormous debt of gratitude to the latter, not least for the delicious introduction he gave us to Piemontese delicacies such as grissini and bunet. Ultimately you will be able to see the real result of our work up close and personal in the new Art of Living Gallery due to open in Summer 2016. ‘Til then, however, our team and our Madonna and Child wish you a very Happy Christmas!! Or better yet: Buon Natale! Fascinating insight into the rigorous research behind the new galleries. Can’t wait to see this object next year.